Logitech is one of those names you’ll probably find all over your house. Whether it’s a mouse or keyboard, your universal remote, computer speakers or a webcam – Logitech makes a lot of things. However, one of the company’s biggest divisions is gaming, which produces many of the peripherals you’ll find in eSports today. Beyond making gaming gear for professional players, though, there’s a far richer history and and development process behind every device Logitech G produces. Logitech first planted its roots in gaming more than 20 years starting with the original Wingman joystick that released in 1995. A few years later, the company debuted their first Wingman gaming mouse in 1998, which sparked their history of excessively engineered experience. This bear-claw shaped peripheral came with a custom driver and USB port giving it a five-times faster reporting rate than any PS2-port connected mouse at the time. 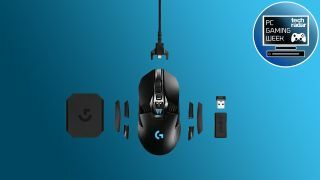 Gamers consider a number of Logitech peripherals to be legendary, including the MX518 gaming mouse and G15 gaming keyboard. Most recently, the G900 Chaos Spectrum has been heralded as the ultimate wireless gaming mouse by ourselves among many others. To make a peripheral as good as the Logitech G900, the company goes through a painstaking process of engineering and testing that’s on the level of NASA or any other research facility. While on a trip to the West Coast, we were invited to see some of this process at Logitech’s office in Newark, California. At the heart of the G900 is a new Lightspeed Wireless module that not only produces a strong signal but is designed to be faster than a wired connection. Obviously, such a feat requires a lot of testing. So to this end, Logitech rolled the mouse around a giant wheel for weeks on end to monitor its performance. All while it the team simulated some of the harshest radio signal saturated situations. This was done to see how it stood up against its own wired performance and against other wireless mice competitors. In another test, Chris Pate, Portfolio Manager, went on to explain just how their mice are tested for tracking speed with a catapult. That’s just a few examples of the of extreme testing that happens at Logitech. However, beyond the machine and synthetic testing, Logitech also has a room set aside for eSports players to come in and give feedback on peripherals still in development. “When you ask them about comfort they’ll palm the whole thing and when they play they’ll keep changing their grip constantly,” Ujesh Desai, vice president and general manager of Logitech G says. The eSports room is a recent development and originally began as a training space to accommodate players traveling to the west for events. Since then, the added human input has been invaluable for Logitech and was crucial for the launch of the G303 Daedalus Apex. All of this testing is a big point of pride for Logitech and it shows in the products that have been widely regarded by professionals gamers and regular users. Welcome to TechRadar's 3rd annual PC Gaming Week, celebrating the almighty gaming PC with in-depth interviews, previews, reviews and features about one of the TechRadar team’s favorite pastimes. Missed a day? Check out our constantly updated hub article to see all of our coverage in one place.